Syracuse (Italian: Siracusa, Sicilian: Sarausa, Ancient Greek: Συρακοῦσαι – transliterated: Syrakousae) is a historic city in southern Italy, the capital of the province of Syracuse. The city is noted for its rich Greek history, culture, amphitheatres, architecture and association to Archimedes, playing an important role in ancient times as one of the top powers of the Mediterranean world; it is over 2,700 years old. Syracuse is located in the south-east corner of the island of Sicily, right by the Gulf of Syracuse next to the Ionian Sea. In the modern day, the city is listed by UNESCO as a World Heritage Site along with the Necropolis of Pantalica. In the central area, the city itself has a population of around 125,000 people. The inhabitants are known as Siracusans, and the local language spoken by its inhabitants is the Sicilian language. Syracuse is mentioned in the Bible in the Acts of the Apostles book at 28:12 as Paul stayed there. The patron saint of the city is Saint Lucy, she was born in Syracuse and her feast day, Saint Lucy's Day, is celebrated on 13 December. The Temple of Apollo, adapted to a church in Byzantine times and to a mosque under Arab rule. The Fountain of Arethusa, in the Ortygia island. According to a legend, the nymph Arethusa, hunted by Alpheus, took shelter here. The Theatre, whose cavea is one of the largest ever built by the ancient Greeks: it has 67 rows, divided into nine sections with eight aisles. Only traces of the scene and the orchestra remain. The edifice (still used today) was modified by the Romans, who adapted it to their different style of spectacles, including also circus games. Near the theatre are the latomìe, stone quarries, also used as prisons in ancient times. The most famous latomìa is the Orecchio di Dionisio ("Ear of Dionysius"). The Roman amphitheatre, of Roman Imperial age. It was partly carved out from the rock. In the centre of the area is a rectangular space which was used for the scenic machinery. The so-called Tomb of Archimede, in the Grotticelli Nechropolis. Decorated with two Doric columns, it was a Roman tomb. The Temple of Olympian Zeus, about 3 km outside the city, built around 6th century BC. This town is not famous for its lively nightlife, but In recent years, Siracusa is becoming known for its lively events: artistic and cultural events liven up this beautiful Sicilian city and attract an international audience. 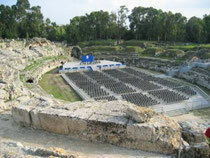 The Theatrical Season at the Greek Theater has become a very popular cultural event, due to the top quality of the plays and to the spectacular and charming open-air “stage”. Night life in Siracusa has also benefited from this new popularity of events: the Isle of Ortigia, the oldest part of the city, has become a meeting place for young people who love to walk around these history-filled places in the day-time, sitting at the many open-air coffee-shops and flocking to the many clubs that are concentrated in the area that spreads out between Piazza Archimede, Piazza Duomo, the Aretusa Fountain and the Alfeo Promenade at night. 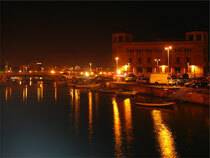 There are many night clubs along the coastline on the Alfeo Promenade to carry one your night of enjoyment. Some of these clubs have dance floors on the beach so that you can dance under the moonlight.